Want to run a Turkey Trot but are you starting from scratch? No worries – I’m here to help! This is a great plan for beginners or people who just haven’t run in awhile. One of my favorite things to do on Thanksgiving day is to run a Turkey Trot! It’s a great way to spend the morning with friends and family before all the feasting begins! Plus, it just makes you feel so much better that you got up and got in a good workout! Most cities have them and do either a 5k, 10k or both. 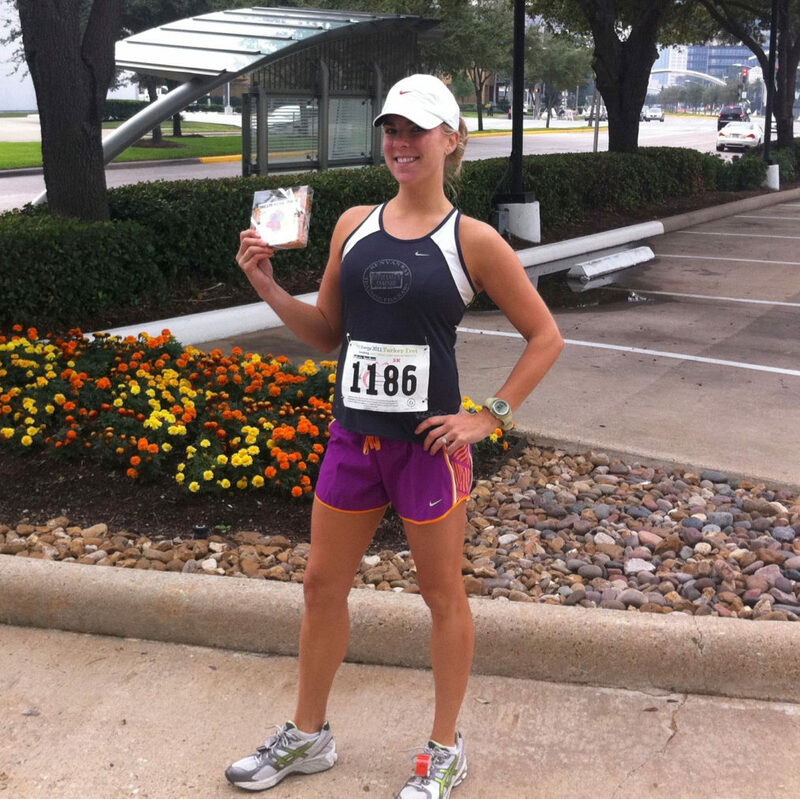 A few years ago I ran the Houston Turkey Trot and placed 1st in my age group in the 5k and then the next year placed 3rd! But, this year is much different – I’m pregnant and haven’t been running much at all! So, I’m actually going to follow this plan in order to be able to run the entire 5k! (if you are pregnant make sure to check with your doctor first before starting an exercise routine). Here is a sample workout plan that will take you from 0 to 3.1 miles (a 5k) in 4 weeks! RW = Run/Walk. Alternate running and walking. If it says “RW 1/3” then that means run one minute/walk 3. If it says RW 2/2 that means run 2 minutes then walk 2 minutes for the time specified. Your running pace should be medium. Walk = Walk the entire time at a medium/fast pace. It should not feel easy and you need to break a sweat. Jog = Jog slow for the entire distance trying not to walk. Warmup walk or jog for 5-10min first. LR =Long Run: Try to run the entire time/distance listed. This should be at a slow to medium pace. FR = Fast Run: Warmup walk/jog 5 minutes first and then alternate a fast walk (or slow jog) for 3 minutes and then run fast (almost sprint) for 1 minute. FLX = Flexibility exercises and/or yoga class. Do some light stretching (warmup first) focusing on legs or go take a class. Core = Do 10 minutes of core work today. You can do this after another workout or just do it at night while watching tv. Do planks, v-ups, crunches, etc. Runners need a strong core! If you can’t jog or run the entire distance – mix in some fast walking, but be sure to get in the entire distance/mileage or time for that day. You can mix up the days a little if you need to (ie if you only have time for 2 miles on Wednesday morning instead of Tuesday just swap days). It’s usually easier to get in your runs and walks first thing in the morning. If not – just fit it in when you can but be sure to be consistent and make a scheduled appointment with yourself! If you are more advanced – I would mix in at least 2 days of strength training. Do a 20-30 minute short workout that is a full-body routine including some squats, lunges, pushups, arms and core. Don’t fret if you can’t run 3 miles by the time the race is here. You can always walk part of it if you need to. But, keep in mind on race day you will have more adrenaline and will be having fun – so most likely you will be able to push yourself comfortably to run the entire time. If you are overweight, this is a great time to try to drop 5lb. Losing even just a small amount of weight will help you run faster, increase your endurance and make you feel lighter on your feet. Stick to a “clean” diet with lean protein, fruits and veggies. Also, be sure to check out my other Turkey Trot Tips here. *If you are looking for other running plans or want to graduate to the 10k after this – try my popular “How To Train For a 10k in 6 Weeks”.